Laurel was developed by perfumer Antoine Maisondieu and contains bay laurel, incense, cedar, pepper, patchouli and amber. 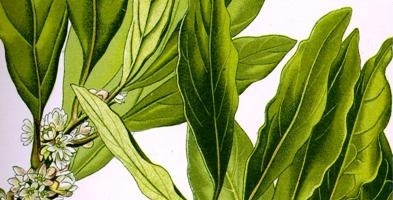 Laurel starts off smelling green and herbal — like a bruised or crushed fresh bay laurel leaf. Quickly, Laurel’s bracing green aroma is joined by “coarse” black pepper and smoky frankincense. In Laurel’s base, the original bay laurel scent (a perfume in and of itself) darkens and is joined by musty-sweet cedar. Then, something wonderful happens: Laurel’s notes combine to produce an accord that smells like one of my favorite flowers — marigold. Laurel has good lasting power with minimal sillage. Though inspired by a soap, Laurel doesn’t smell “clean” — or soapy — and its fragrance is more complex and beautiful than any Aleppo soap I’ve used. Laurel, if I had tried it sooner, would certainly have made my list of the top fragrance releases of 2009. I love it. Comme des Garçons + Monocle Scent Two: Laurel is available in 50 ml Eau de Toilette ($135); for buying information, see the listing for Comme des Garçons under Perfume Houses. Note: top image of laurel leaves [cropped] via Wikimedia Commons. Stacked soaps at bottom right are "Syrian Soap 200g - Olive Oil Soap from Mesopotamia...The gentleness of olives are combined with the strength of the laurel, tens of centuries of experience and a year-long manufacturing process in the warmth of the mesopotamian sun." $10 at Amazon. I curse you, Kevin! I had just decided that I didn’t need to even think about Laurel, but, alas, I have been foiled. Plus, now I need bars of exotic soap. Another review like this and I will be forced to send my accountant over to tie you up with adding machine paper. monkeytoe: this will balance out the wonderful Ninfeo you won! HA! I love it too – and I was nervous since I bought my bottle unsniffed as a Xmas present to myself. Alas, I love everything about it – especially the tenacious pepper accord. I have to really douse myself in it to get it stick (8-10 sprays) but besides that I love it. I wish Monocle/CdG came out w/ a shower gel in this scent. Now I want the soap, you’ve mentioned above. I love big ol’ blocks of soap in my shower. Thanks for the review Kev. Funny, I just purchased the first one (HINOKI) last night at Barneys. They still didn’t get this one in yet. Carlos: I have no DOUBT you’ll have this “in stock” in your cabinet sooner than later. Shall we bet? I’m no dummy…I’d lose bud! HA! Pick a date, and bet him… a FB of this. Then if you hold out, you get it for free. LOL! Mike: a shower gel would be nice! Hi Kevin. I must try this. Wonderful review, and the reference to marigold very much intrigues me. However, I’ll also use it as an opportunity to recommend to anyone who is intrigued by Laurel to also give a try to my BELOVED Profumum Victrix, which is just slightly lower in price per ml, and is an amazing mélange of bay laurel and pepper. I’ve heard complaints about strength, but it does beautifully on me when sprayed. Joe: I STILL haven’t had the chance to try that one, but it’s on my list. Now I am really really curious for that. I havn’t ever smelled marigold flower. I like the aleppo soaps very much. They ate my favorite soap-smell, but I had my doubts if it would work for a perfume. After this review I think I can change my mind. air: hope you like it. Well, “marigold” sure caught my attention, because it’s one of my favorite flower smells, too. I’ve been wearing my Niki de Saint Phalle a lot lately — just love the marigold smell in that one! I wonder if this Laurel would be good on a woman? Oh the soaps look amazing! $10 for a hefty bar is very reasonable. alltheprettythings: they last forever, too. Marigold, you say? Oh, dear, looks like I’m going to have to try this one. I love the way marigolds smell, but have never found anything that quite smells like them. I did think Dune smelled vaguely marigold-y, but rumor has it that I’m the only one who thinks so. I had gotten excited when Bal d’Afrique listed a marigold note, but that one didn’t develop in the way I thought it would. Now I need to revisit my sample of Niki de Sainte Phalle per Haunani’s comment! Oh yes, NdSP is all about the marigold. I was just trying to remember if I had a sample of that, and remember H. is the one who gave it to me. I’m going to have to try that one again when I get home today. My mother has this beautiful story about how my uncle loved marigolds, and after he died marigolds spontaneously sprung up in her front yard. Not just some, but practically a field of marigolds. (I know nothing about plants, so I have no idea if this is unusual. I like to keep the magic alive by not knowing.) Maybe that’s part of why I like them so much. What a great story! Marigolds are such cheerful flowers, and I love their not-too-sweet, pollen-y fragrance. For those who might not know, Tagetes is the scientific name, and we sometimes see that in lists of perfume notes. Joe: I didn’t know NdSP was marigold-y either…will try it. Miss K: remember, don’t DAB, pour on the entire sample vial for this one, or put it into a tiny spray vial. It comes alive when applied generously. This sounds so awesome, I can hardly stand it. I have a favorite plant, a bay laurel given to me by my mom around 15 years ago that is now around 5 ft tall, in a huge Italian terra cotta pot in my kitchen – so I always have plenty of fresh leaves available for cooking. The scent of the fresh leaf is amazing. And marigold – I’m always shocked that their scent is often regarded negatively. I adore the bright pungent scent. And those other notes! Must. Try. This. Perfume. Thanks so much for the review! And see…try as I might, despite all those early childhood “plant your mom a marigold for mother’s day” projects, I can’t think what a marigold smells like. I keep trying, and I keep coming up dandelion. That’s funny… I find it kind of astringent and bitter and somewhat powerful in the way geranium leaf or tomato leaf is, but of course it doesn’t smell like either of those at all. I have deadheaded so many marigolds in my life. JOE: I love the smell of my fingers after I deadhead marigolds…and the pretty orange flowers dried are pretty in potpourri too. I used to plant marigolds between my tomato plants to keep the tomato borer off the tomato, they didn’t like the smell (or taste) of marigolds. I used to dry the petals (but remove the pollen pistils), store them in jars by color and put them into my handmade paper. No, the paper didn’t smell like marigolds. But now that I’m geezing, I must try this. Pepper is a scent I have round heels for. Boojum: I think of them as peppery, with a dash of daisy and a hint of tomato leaf. RusticDove: you’re welcome…I did try this perfume next to some real, laurel leaves from my tree and was so happy with the true-to-laurel aroma the perfume has. This sounds great, though the references (bay, marigold, etc.) are not shared on this end. I’m still curious, though. Comme des Garcons is usually at least worth sniffing. Kevin, I can’t believe it! Ive waited 22 years to hear someone else say they like the smell of marigold! Back in ’87 I was in a gardening van with two other girls, and I happened to mention that I like the smell of marigold, which was met with a sort of stony, puzzled silence. This Laurel fragrance sounds divine. Those soaps sound fantastic. Wish I could get my hands on those.